BOSTON – The clock on the wall read 1:17 a.m.
A janitor, decked in his blue one-piece cleaning suit, had already started the corridor-cleaning routine, moving the mop back and forth in a rehearsed motion, just like the hands of the clock. On Commonwealth Avenue outside, which during the day brings thousands of students and individuals navigating their ways through a constant flow of traffic amidst blaring horns of the Green Line trains, now seems haunted – not a single soul visible to wake the resting nerve that runs right through the center of Boston University. For hours on this particular Tuesday, Nov. 4, more than 75 B.U. students, mostly from the communications department and a number of journalism professors, had been working on preparations and arrangements for the live broadcast of the 2014 midterm elections on butv10. The live coverage started at 9 p.m. Tuesday night and continued until around 2 a.m. Wednesday morning, largely due to the very close gubernatorial race between Democrat Martha Coakley and the new Republican Governor-elect of Massachusetts, Charlie Baker. Ashley Davis, 26, the executive producer for the show who was in “the ears of anchors, in the ears of directors,” and other production control room personnel coordinating the content and the flow of the show, said the five hours felt like 20 minutes. Davis, a fair-toned, dirty-blonde third semester broadcast journalism student, who wore a red long-sleeved shirt and dark jeans, said she and everyone else involved in the production had spent months in preparation and hours stressing on working out a format for the show. Ashley Davis, the executive producer for one of the studios during the live election broadcast, in action. However, the due diligence paid off since the team was prepared for any curve balls thrown its way as races were getting called and surprises unfolded throughout the night, noted Davis. Junior Courtney Sonn, the director of the Studio East for the night, said her first experience of election coverage was amazing and full of adrenaline. Fair-toned Sonn, a broadcast major who wore a black sleeveless vest, tied her light brown hair to a ponytail and was seemingly the shortest girl in the production room, was also the loudest, and at most times, the only voice, there. Despite having spent the entire five hours with detailed instructions on how to carry out all the necessary tasks, including calling all the camera and production cues and ensuring content was readily available, “you don’t get tired till the very end,” said Sonn, who, past 2 a.m., was still beaming with excitement. Taylor Walker, 21, a broadcast journalism senior who hosted the hour block of the live coverage from 10–11 p.m., reminisced on her previous experience of working as a teleprompter operator during an election some years ago. Walker, who also contributed to the Boston University News Service’s elections coverage, said that she had started looking at the campaigns during the summer in preparation for the big night. She reflected on one particular experience during that time, her interaction with then unknown Democratic candidate Seth Moulton, who is now a representative-elect to the Congress having won his race in the 6th Congressional District of Massachusetts. 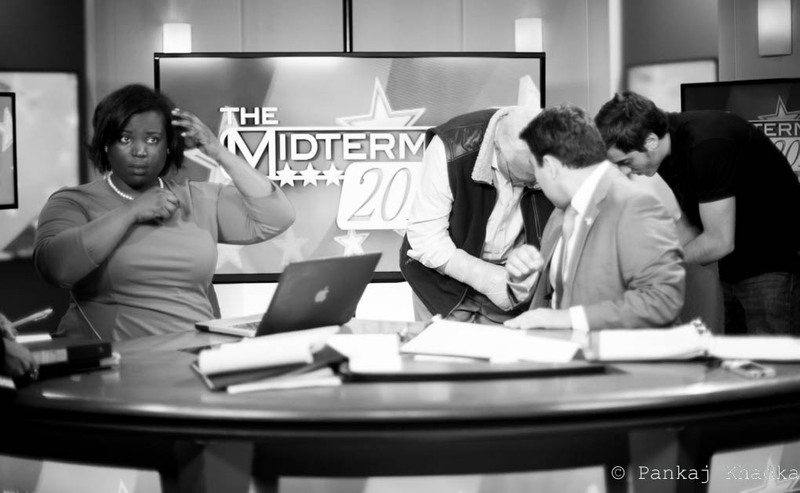 Taylor Walker, left, one of the anchors, prepares for a segments during the 2014 midterm elections live broadcast. Most of the city residents must have already slipped into their warm beds and pulled under their blankets while Walker was being interviewed, and though she knew that she should say she was tired by 1 a.m., she was at a loss for words to describe how she was feeling, she said. Alexander Hirsch, 25, a first-year graduate broadcast journalism student, was filming live at Copley at the reception for Democratic Sen. Edward Markey, who was re-elected. Hirsch said it was an interesting experience that he hadn’t thought he would have had a couple of months into graduate school. “Your heart’s moving really fast. You’re with all these higher ups that, like, I feel like they could just squash you in a second,” said Hirsch. “The hard part is, you know you’re student and you’re trying to act professional, and that’s also the exhilarating part. The whole thing’s exciting,” he continued. Anne Donohue, a journalism professor who mostly teaches radio, said most of her radio students got sucked into the butv10 or BUNS vortex, leaving her with a “ragtag group” of freshmen, two public health students, news director of WTBU Radio and a couple of her radio students. 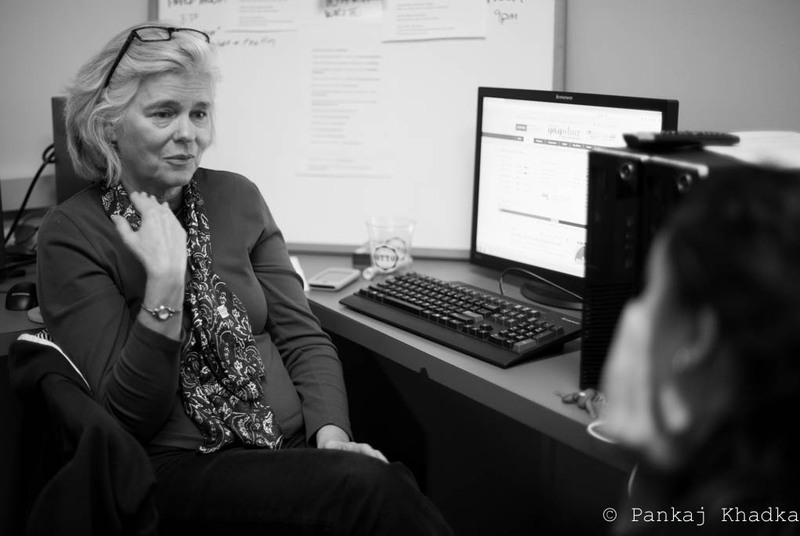 Anne Donohue, a journalism professor who mostly teaches radio, worked with COM students to put together regular on-the-hour and on-the-half-hour updates throughout the election. The team put together regular on-the-hour and on-the-half-hour updates throughout the election and made live calls to the reporters at campaign headquarters, all of which paid off as the team was the first to call New Hampshire’s Democratic Sen. Jeanne Shaheen’s re-election on Tuesday night. R.D. Sahl, an associate professor of journalism who spent more than 40 years as a television correspondent and anchor and has covered election nights as far back as 1968, said he was in “awe” at the students’ coverage of the election night. Sahl, who was the studio and anchor producer for the coverage, said one aspect he loved about his job was seeing COM students achieve bars no matter how high they’re set. Sahl also noted that despite the lack of resources in comparison to a commercial television station or a network, the team was able to leverage its resources in the best way possible to follow and capture all the important local, regional and national story lines ranging from Massachusetts to New Hampshire to the control of U.S. Senate. R.D. Sahl, an associate professor of journalism and the studio as well as anchor producer for the election night coverage, checks online for timely updates on the election in one of the studios at COM. 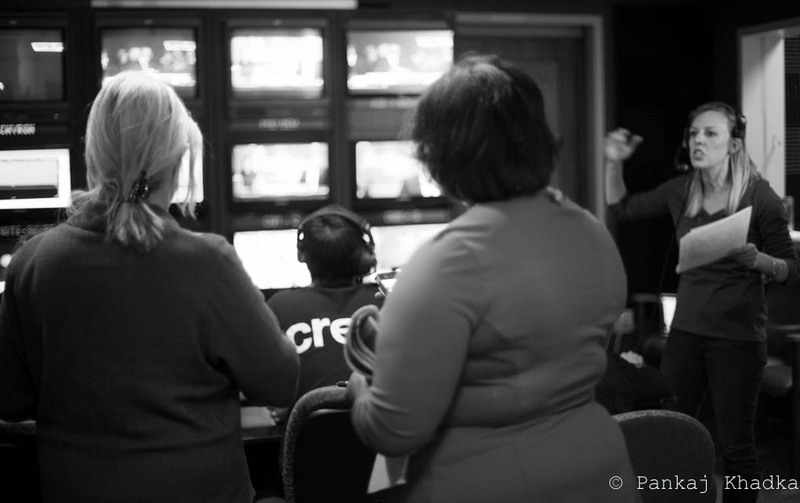 Supriya Muppala and Peter Zampa, two of the live anchors during the 2014 midterm election coverage, prepare for one of the segments during the live broadcast. Journalism professor Michelle Johnson, left, and Dean of Communication Tom Fiedler during the live election coverage in the Ezratti Lab at COM. Journalism students who were part of the live broadcast of the 2014 midterm elections on butv10. A journalism student has her eyes fixed at the live updates of the 2014 midterm elections on butv10. Dean of Communication, Tom Fiedler, checks for election updates during the live election coverage at COM. R.D. Sahl, left, the studio as well as anchor producer for the election night coverage, and anchors Peter Zampa and Jamie Bologna, right, prepare for the live broadcast. Journalism students had to stay in the studios past 1 a.m. on Wednesday morning as the election coverage continued. Journalism students and professors congratualte each other after succesfully covering the 2014 midterm elections. R.D. Sahl, left, congratulates Jamie Bologna, one of the live anchors of the 2014 midterm elections live coverage, after wrapping up the show. Journalism students Mikaela Lefrak and Jamie Bologna, who hosted part of the 2014 midterm elections’ live coverage, take a selfie after finishing the coverage for the night.